Recently the U.S. Census Bureau merged the Profile of U.S. Exporting Companies and the Survey of Business Owners from 2007. (Unfortunately that is the most recent date of the two surveys.) And the information gleaned from it for anyone looking for a Local-Global connection is interesting. The survey focused on ‘classifiable” companies — those identified by race, gender or veteran status. Of the companies reviewed, employment was highest among exporting firms. The average number of employees for minority-owned exporting employer firms was 21; the comparable number for minority-owned nonexporting employer firms was 7. The average number of employees for Hispanic-owned exporting employer firms was 19; the comparable number for Hispanic-owned nonexporting employer firms was 7. The average number of employees for women-owned exporting employer firms was 42; the comparable number for women-owned nonexporting employer firms was 8. Average receipt reports also showed that exporting companies were bigger money makers than those focused on just the domestic market. Minority-owned exporting firms: $7.4 million; nonexporting firms: $141,776. Hispanic-owned exporting firms: $7.2 million; nonexporting firms: $124,418. Women-owned exporting firms: $14.5 million; nonexporting firms: $117,036. Veteran-owned exporting firms: $19.5 million, nonexporting firms: $371,143. So, a smaller percentage of each group does exporting. But the exporters bring in more money and hire more people. Sounds like exports are an important part of any effort to growing the economy. And many small and medium-sized businesses are part of that growth. Wouldn’t it be nice to see more stories connecting domestic (LOCAL) growth with the exports (GLOBAL) handled by these LOCAL companies. Maybe even a few feature stories about how and why the businesses started and why the owners decided to go with exports instead of exclusively working the domestic market. Stories that make these connections will help the American reader/viewer better understand trade issues and why non-military international affairs are important to local success. China’s missing rivers: Nothing to it! Only 22,909 rivers covering an area of 100sq km were located by surveyors, compared with the more than 50,000 in the 1990s, a three-year study by the Ministry of Water Resources and the National Bureau of Statistics found. In other words: It’s not our fault! Unfortunately, too many experts in the field say it is very much the fault of Beijing and its desire to industrialize everywhere. 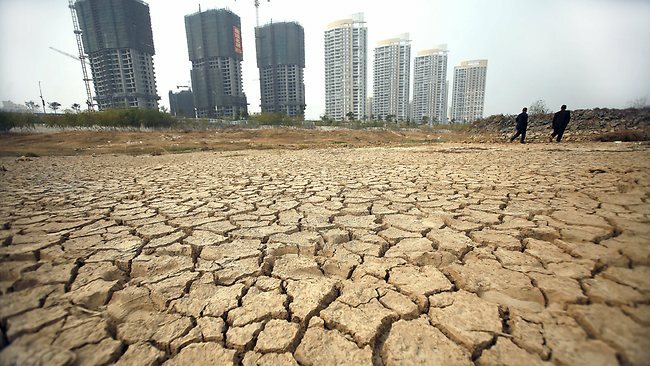 The projects include massive damming programs to provide power as well as large-scale industrial development that sucked the rivers almost dry and then spit out highly toxic waste, leaving most of the existing rivers so polluted that people cannot eat the fish from the rivers nor swim in the rivers. “The rivers I used to play around have disappeared; the only ones left are polluted, we can’t eat the fish in them, they are all bitter,” a person using the name Pippi Shuanger wrote on Weibo, the Chinese version of Twitter. Now, the water pollution news out if China is important to Americans and Europeans. A major country cannot just misplace half of its rivers (and allow the other half to become highly toxic) without the rest of the world feeling the impact. That impact could be as simple as the possible starvation of hundreds of millions of Chinese because they have no water for farming or the water used is so infused with heavy metals or other toxins that the food produced is poisonous. It is bad enough if the toxin-laden food is only eaten in China, but China also exports food products for humans and animals around the world. There is so much to write about Yoani Sanchez’ global tour that it is just better to click on the Freedom House summary rather than have me copy a bunch of excerpts. March 21 marked the end of the New York leg of Cuban blogger and activist Yoani Sánchez’s highly publicized international tour. Since beginning the 80-day, 12-country whirlwind of speaking engagements in February, Sánchez, whose blog Generación Y is now translated into nearly 20 languages, has been met with equal measures of protest and warmth in Brazil, Mexico, Europe, and the United States. Arguably the most influential blogger writing within Cuba, Sánchez was denied an exit visa 21 times over the last five years, but she finally received permission to leave the island last month under a broader government initiative to loosen travel restrictions. While Sánchez’s success in securing a passport after years of formal requests is significant, it would be a mistake to view the shift in exit requirements—or the recent activation of a highly anticipated fiber-optic cable (ALBA-1) to enhance the island’s internet connectivity—as evidence of a sea change in the regime’s attitude toward civil liberties such as freedom of movement and access to information. Cuban blogger and dissident Yoani Sanchez was the guest of the United Nations Correspondents Association this week. The visit was part of Sanchez’s world tour now that exit visas are no longer required to travel outside the country. But just because the exit visa law was changed does not mean the Cuban government has changed its views about dissidents. In just about every country Sanchez visited, pro-Cuban forces showed up calling her a tool or mercenary of the United States. In Brazil, she was not able to view a film about her and other dissidents because of the demonstrations. At least Yoani saw the demonstrations for what they were: examples of people exercising their democratic rights to demonstrate for or against a particular point of view. Of course, the irony of the situation was lost on the pro-Cuba demonstrators. They would never have been able to mount similar demonstrations against a Cuban policy in Cuba. Cuban diplomats around the world were always suspected of being behind demonstrations. (The themes were universal around the world and the props were all the same. Too much uniformity for “spontaneous” demonstrations of “outrage” against Sanchez.) Finally, in New York, the Cuban government came out from behind the curtain. The UNCA sponsored a press conference for Sanchez in the United Nations building, something that is pretty common. It is a pity that the Sanchez world tour — hell, even the U.S portion — is getting so little coverage by U.S. media. The exceptions are The Miami Herald (duh!) and Fox News Latino (double duh!). There are the occasional wire stories — as in McClatchy story linked above — but other than that, the presence of one of the most powerful and rational voices against the Cuban dictatorship is moving through Washington and New York with little attention by the mainstream press. Why is her visit important? To begin with Sanchez could only leave once Cuba repealed the exit visa requirement. That requirement alone should tell people more about what Cuba was and is than anything else. Only dictatorships require exit visas of its people. The fact that the Cuban government eliminated the exit requirement is a story about changes taking place in that country. Committee to Protect Journalists: Though Cuba projected an image of a nation opening up economically and politically, it took no substantive steps to promote freedom of expression. Human Rights Watch: Cuba remains the only country in Latin America that represses virtually all forms of political dissent. Amnesty International: The Cuban authorities continued to stifle freedom of expression, association and assembly, in spite of the much publicized releases of prominent dissidents. Hundreds of pro-democracy activists and dissidents suffered harassment, intimidation and arbitrary arrest. What does this mean to the average person in the United States? For too many people in the U.S. population (and in Congress) the only Latin American countries worth noting are Cuba and Mexico, and Mexico often comes in as a second thought. Irrational and emotional arguments are a dime a dozen when dealing with Cuba. Finally, there is a rational voice from Cuba that is highly critical of the Cuban government allowed to travel and she gets little or no coverage — again, with the exception of the Miami Herald. The Herald sees the immediate connection between the Sanchez tour and its audience. But where are the stories from the New Jersey/New York papers? The second largest Cuban population in the United States is in New Jersey. Apologists for Cuba (and Venezuela and Ecuador) will not want to hear what Sanchez has to say, nor will they agree with it. Likewise, the rabid right-wing anti-Castro crowd will have difficulties with some of what Sanchez is saying — other than her unwavering belief in freedom of expression and democracy. Too many of the older anti-Castro group are hung up on returning property taken in the 1959 revolution. The issues are different now and many younger Cuban Americans know that. The anti-Castro lobby in Congress has not yet seemed to catch up. It would be nice to see some stories of Cuban immigrants in the United States about how they got into the country, why the came and what they see as their future and the future of Cuba. I have talked with younger Cuban immigrants. They came to the States for the same reason most immigrants come: freedom and a better life. They are not from the elite families of the old dictatorship looking to return to power. They are immigrants, pure and simple. Yes, they have opinions about the changes that should be made in Cuba — after all they still have family there. But if reporters took a few minutes to think about it, the stories of the 21st century immigrants will be different from those of the mid-20th century. And once their stories are heard, then more people will stop thinking about Cuba and relations with Cuba with a Cold War mentality. They might even start looking at Cuba the same way the look at China, another brutal dictatorship that is famous for repression of freedom of speech and press, but with whom the U.S. is more than happy to deal with on the international scene. A Sky News reporter was detained (oh, wait, no he wasn’t but he wasn’t allowed to leave either) in Tiananmen Square. He was taken to a nearby park and then told he could not do any reporting there because he did not have permission to film in that park. The Chinese security forces thought he was recording material for a later report but instead he was live. The whole mind-boggling episode went out to the world. How much you want to bet “the appropriate authorities” find a “problem” with his visa? Fifty-seven percent view trade as “an opportunity for economic growth through increased U.S. exports,” while 35% see it as “a threat to the economy from foreign imports.” During the prior two years, Americans were evenly divided in their opinions about trade. In a globally connected world, international trade is the lifeblood of growth and development. And yet, so few people know anything how much international trade affects their individual lives. All the Toyotas,Hondas, Hyundis, etc. on the road. The majority owner of Burger King is the Brazilian investment firm, 3G. TomTom, the popular GPS firm is a Dutch company. And none of that, the treaties that allow for protection of American companies making sales overseas or allowing foreign companies to invest in the US, can happen without a fully functioning and staffed foreign service. To be clear, my wife is a career diplomat, but the foreign service also includes people from the Departments of Commerce, Agriculture, Justice, Labor, etc. A country does not remain prosperous unless it finds new markets for its goods and services. As more countries develop — Brazil — they become competitors. It is in the economic well-being of the United States and its companies to help impoverished countries develop strong democratic institutions and strong economies. Helping farmers in Honduras come out of poverty and ensure their children are educated means fewer illegal immigrants to the United States but more importantly future clients for American products. That means foreign aid is an important factor in the economic well-being and security of the United States. Unfortunately, foreign aid and the foreign affairs budget in general always seems to be the target of budget cutters. Phil Plait — The Bad Astronomer — wrote about the budgeting cutting mania aimed at NASA. His complaint could be just as true for the foreign affairs budget. [I]f you have a hard drive full of 4 Gb movie files, you don’t make room by deleting 100kB text files! You go after the big targets, which is far more efficient. In the case of NASA, the space agency budget is just a little less than 1% of the federal budget. In a survey in 2010, the Program for Public Consultation asked people to estimate how much of the federal budget goes to foreign aid. The average estimate was 21%. The average response for how much would be “appropriate” was 10 percent. The real number for ALL non-military foreign affairs activities: About 1.5%. Yep! That small amount accounts for all the salaries of all the U.S. diplomats and local employees in embassies around the world, the rent, maintenance and repairs for all embassies and consulates, all the costs for the State Department headquarters and related buildings in Washington, all the processing of passports, all the trade negotiations, all the Commerce Department assistance to American businesses looking to sell goods and services overseas, all the marketing of US agriculture goods to other countries and all the foreign aid that helps bring millions of people out of poverty. The U.S. military spends more on its marching bands than the State Department pays for its diplomats. There are more soldiers, Marines, sailors and airmen in marching bands than there are U.S. diplomats. So why is the foreign affairs budget always under attack? Basically it is because there is no constituency for foreign affairs. The State Department does not build factories in just about every congressional delegation (as does the Pentagon). So the only people who care about the budget are either so-called “budget hawks” or people involved in international affairs. And because the issues of foreign affairs do not fit on a bumper sticker, few people care until something bad happens. And this all gets back to the Gallup survey on the value of foreign aid. If more reporters opened their eyes, they could see how their local economies are dependent on international connections. Or how international events have a direct impact on local events. It would help if the State Department would also encourage its people to step out and start explaining to the general public about why having a foreign service is important to the economic well-being of the United States. Yes, some do, but too many do not. It would be nice to see more discussions taking place in high schools and local news outlets about the local-global connections. And — most importantly — how the economic well-being of the United States depends on international affairs and international trade. Face it, this ain’t the 1950’s any more. It ain’t the 1960’s or 1970’s. This is the 21st century and that means reaching across borders for goods, services and accommodations.